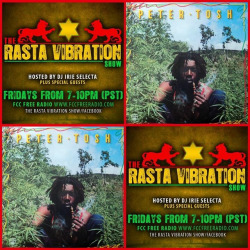 We are Blazing the air waves with nuff reggae music tonight on The Rasta Vibration Show! Droppin 2 great albums tonight! Triston Palma’s Joker Smoker and Johnny Osbourne’s album Folly Ranking. We also have 2 cd’s to give away courtesy of VP Records… Strictly the best volumes 48 & 49! Tune inn tonight 7-10pm(pst) worldwide on www.fccfreeradio.com Studio 1A!!! !